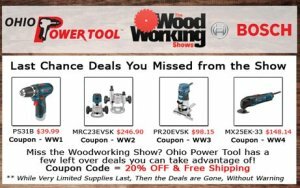 Ohio Power Tool is taking some of the deals they offer at The Wood Working Shows and is putting them online for all to take advantage of, and these deals are awesome. What they have is 20% off a few popular Bosch tools and the addition of free shipping. All four items are lower than what Amazon is offering. Take a look at the deals below, and be sure to use the correct coupon code for each product.